You can win $100 for your team by bringing in canned goods to the opening day ceremonies this Saturday. Sears, Farmers Market and Lawrence Brothers are volunteering shopping carts for each team. The team that fills their cart up the most will win the $100 Visa Gift Card. You can use that to buy a new bat or helmets. Maybe some new softballs or catchers equipment. Or you can use it like the Sluggers and blow it all on ice-cream. If you’re a spectator and are just wanting to check-out our brand new fields, you could win a little something, something too. For every two (2) cans you bring to opening ceremonies you will be entered into a drawing and could win a $100 Visa Gift Card or a $75 Target Gift Card. Opening ceremonies start at 9:00am so bring your food early or you could miss it. – REMEMBER THE MORE CANS YOU BRING THE BETTER YOUR CHANCES ARE AT WINNING!!! All food generated will be donated to the Roswell Community Kitchen. 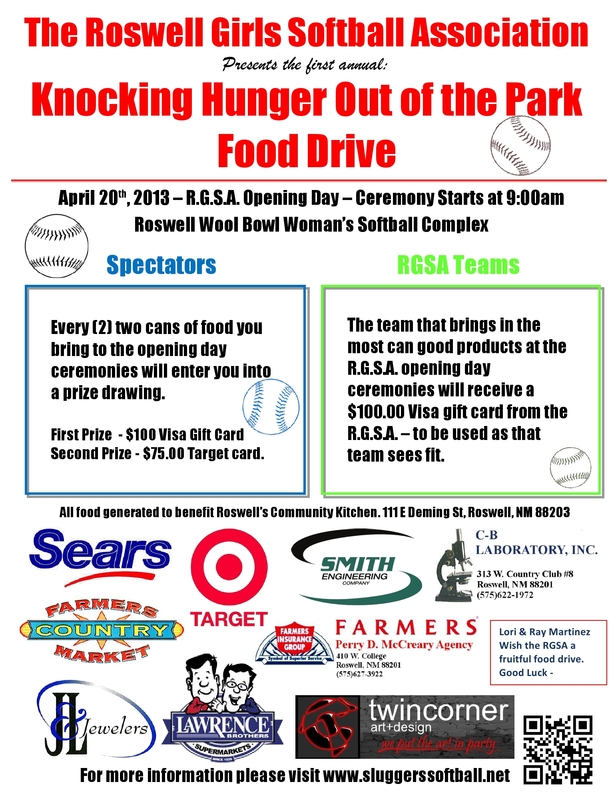 This entry was posted in opening day, Roswell Girls Softball Association and tagged $100, drawing, food drive, hunger, ice cream, money, Opening Day, prizes, Saturday, Sears, Shopping cart, Sports. Bookmark the permalink.